Setting appropriate goals is a great way to improve your performance in any field, and safety is no different. How do you set the most effective goals? 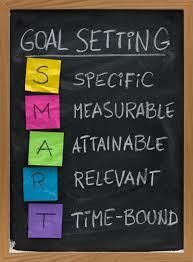 What types of goals should you set? And how do you track them? The first step is to identify the areas around which you will set your safety goals. You may be tempted to set a goal to reduce your injury rates by a percentage. However, we recommend that you set goals around safe behavior (actions) rather than injury rates (results). Setting goals around injury rates may create an incentive for employees to under-report injuries. So instead of setting a goal of "zero eye injuries in 2014", the goal should be "95% use of safety glasses in 2014". You could set goals around use of personal protective equipment, safety training attendance, participation in Job Safety Analyses, or any other metric that is significant for your business. The key is to choose goals that are meaningful to your organization, are easy to measure, and that will improve your company's safety results. Once you have identified the goals, make sure they meet the SMART test - Specific, Measurable, Actionable, Realistic and have a Time limit. When you set safety goals, you should ensure that your goals comply with the following 5 components. An example of a poorly written goal is "We will implement a fall protection safety program this year." Each employee will participate in at least 2 safety meetings by March 31, 2014. Each employee will complete two Job Safety Analyses for their job by January 31, 2014. Each team will achieve Safety Training Attendance of 95% by the December 31, 2014. Set up a simple 1-page Monthly Safety Activity Report that you can review monthly to see if you are on track with your goals. Your report should track your proactive measures (behaviors), your injury rates (your results), and allow you to compare current performance with historical results. We recommend keeping it to one page to avoid information overload.